I got word from Bishop Roald Flemestad that he had been in Germany. The Nordic Catholic Church website gives an article about ordinations from the Christian Catholic Church and the Order of Port Royal. I used Google for the translation from Norwegian and “tidied up” a little. I hope I have not betrayed what was intended to be said. On Saturday 17th November Bishop Roald Nikolai ordained two new priests in Germany, Brother Gerhard Seidler OPR and Dr Thomas Döll. Fr Gerhard was ordained as a monk priest in the Order of Port Royal. Dr Thomas Döll lives in Karlstadt and runs the Sinnakademie, a counseling and personal development academy. He will also be running a parish in Karlstadt. There were about 100 people present at the ordination, held in the church in Munich of SELKE (Selbständige Evangelish-Lutherische Kirche). The Bishop had a full programme in Germany this last weekend. It started with a pastoral conference with clergy in Germany, where the theme was both NCC spirituality and strategies for the ongoing church work in Germany. In Hanover, the Bishop had talks with the Bishop of SELKE, which gives the NCC the use of their church in Munich. This is a 150 year old Lutheran church. The two Bishops were agreed on the most burning questions of our time, and Bishop Hans-Jörg Voigt expressed great interest in continuing contact with the NCC and the Christi-katholische Kirche under Abbot Schlapps. This entry was posted in Uncategorized and tagged Nordic Catholic Church, Northern Catholicism. Bookmark the permalink. I ought to clarify this. Abbot Klaus Schlapps does not have episcopal status in the Nordic Catholic Church. He enjoys delegated jurisdiction over the Christ-Katholische Kirche as a vicar episcopal under Bishop Roald Flemestad and is the Abbot of his community. He is a priest. However, I am open to correction if I am mistaken or incorrectly informed. Exactly, Father! Abbot Schlapps is just that, abbot over the monastery and in the Order of Port Royal, nothing more and nothing less. As abbot he has the rank of bishop, in the premises of his monastery only and can neither ordain or incardinate any priests whatsoever outside his monastery. The only bishop is + Roald Nikolai. Germany is an administrature of the Nordic Catholic Church, called the Christ-Catholic Church, but it is still an administrature and not an independent church. 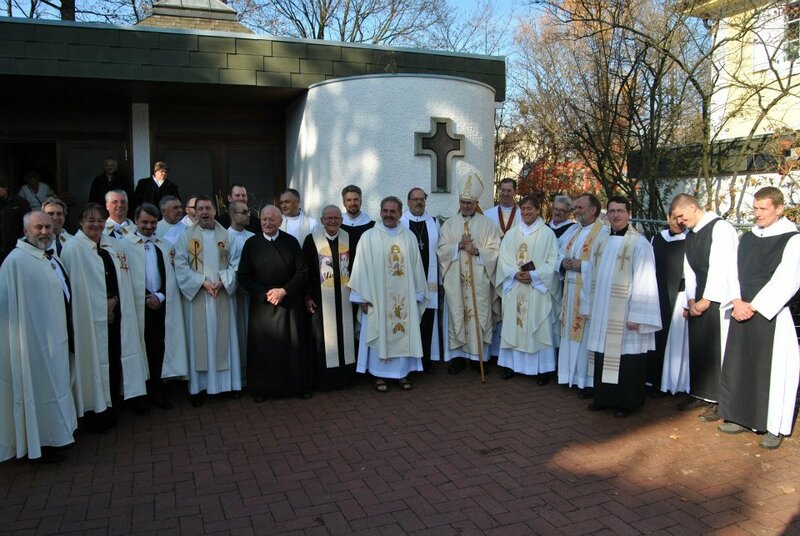 The vicar general in Germany for bishop Roald Nikolai, is F. Klaus Maas. Many thanks, Brother. My information was not completely accurate. Of course, an Abbot has pontifical privileges as does a Protonotary Apostolic in the Roman Catholic Church. The pontifical insignia represent jurisdiction, even in the absence (or disuse) of the episcopal power of order. This is also the case of the Ordinaries of the Personal Ordinariates in the RC Church for former Anglicans. They are priests with ordinary jurisdiction over their designated flocks. Thanks Father … I wonder where this leaves me in all this. No doubt an ordained Priest without an affiliation, which saddens me even more after my time in the TAC. I will write to + Rouald to ask for clarification. I had asked + Klaus sometime ago that I wanted to be incardinated in the NCC. You should write to Bishop Roald. These matters are best not discussed on a blog. Being in a position of a priest whose world has dropped away from under his feet is unenviable. But it is something we have to put up with until we have confirmation of everything and proper papers. Until then, we have nothing to say. just to let you know that I checked the translation and everything is in order!